A free-form pond can be customized for any landscape, with different rocks, plants, shapes, and waterfalls. But we’ll give you some helpful points on placement, size, and materials. Before you start, call 811 or your local one-call center to have electric and gas lines marked so you know where to dig to steer clear of them. Then, when you map out the location of your pond, put it where it will be noticed—visible from a window, off a patio, or along a walkway—but away from the play areas of small children or pets. Keep clear of major root systems or mature trees, which can block too much of the sunlight plants and fish need. 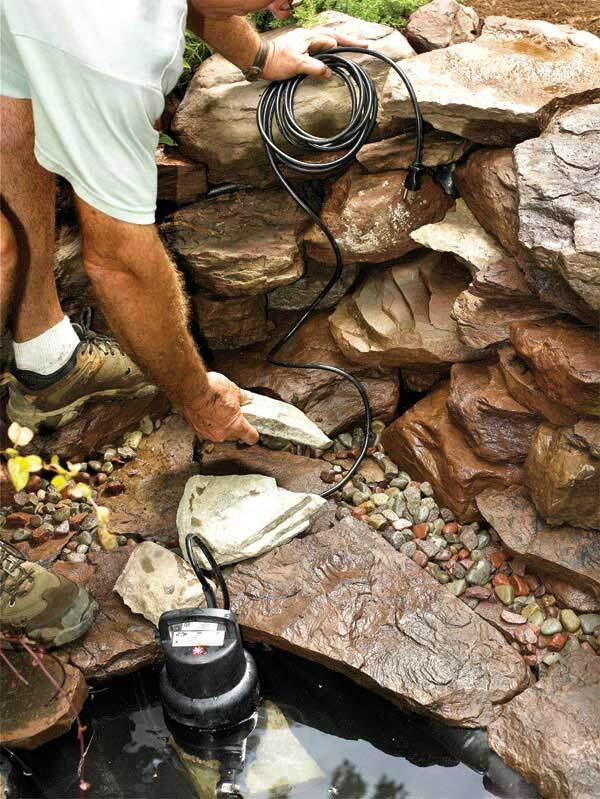 You’ll also need to be within reach of a grounded exterior outlet so you can plug in a pump, an essential tool for keeping the water aerated; most pumps come with a maximum cord length of 25 feet, and extension cords are not recommended. You may need to bury the power cord a few inches down in PVC pipe to hide it.